Presenting the new Bentley Continental GT Convertible. 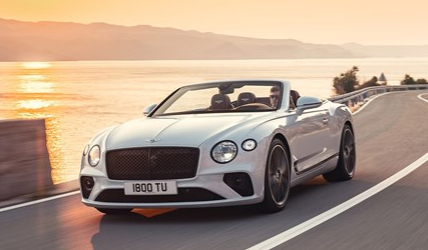 We are more than excited at Signature Car Hire to share details about the all-new Continental GT Convertible which Bentley has just released. And, as you would expect it is truly awesome! This beautiful Grand Tourer has been designed, engineered and handcrafted in Britain as usual and represents everything that Bentley knows about producing a stylish and elegant GT Convertible in a very luxurious way. Chairman and Chief Executive, Bentley Motors, Adrian Hallmark commented about this model “Elegant understatement that forces you to look; engineering excellence you’ll take for granted – the extraordinary breadth of capabilities offered by the new Continental GT Convertible is unique and can only be offered by our noble British brand. There is no mistaking that this open top tourer is elegant with a sophisticated sculptural exterior that complements beautifully with a charming handcrafted cabin which showcases the highest quality leathers and sustainably sourced veneers on the market. Watch this space as we reveal more details about this beautiful new addition to the Bentley fleet of luxurious cars. Can’t wait to try this Bentley, and then why not rent one of our many beautiful Bentley hire cars in the UK with Signature Car Hire. Get your instant on-line quote today.